Dougie Bain reviews Skyhook's C57D. Accuracy: 9 - Looks like the C57D to me! Since I was a small child, I was taken aback by the classic 1956 movie 'Forbidden Planet'. Most sci-fi films prior to this (with few exceptions) were all shaky sets and BEM's. and all directed by Fred Wilcox, whose main claim to fame was 'Lassie' movies. I also think it was the first time that humans used a saucer, which was usually the perogative of the aliens. So when surfing the web and spotting the model on Skyhook's site I immediately had to have her. I put in my order, which arrived around 8 days later all the way from the States (I live in Scotland). 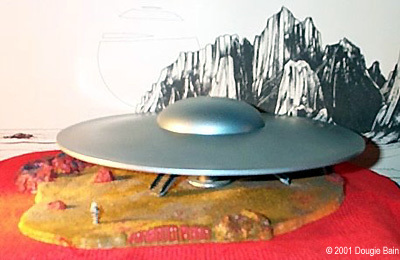 The model comes boxed with a colour picture of the C57D sitting on the surface of Altair IV. The model can be built in the 'Flying' position but this would in my opinion be a waste of a good diorama. The C57D model itself consists of 8 pieces: the main saucer, upper and lower domes, landing strut, landing pad and three stairwells. You also get 'The world's smallest Robbie' - and at just half an inch tall I'd agree - plus a base that looks like a piece of desert and rocks with the title of the film emblazoned on it. Construction was straightforward, and consisted basically of putting all the saucer bits together. None of the pieces on my example required any filling at all, and only the saucer rim required very minor sanding to remove a mould seam. Apart from that no other sanding. The three stairwells went on with ease, in large part because Skyhook provides a plastic 'guide' so that you get the correct angle to glue the pieces to the underside of the model. The stairwells are my only minor gripe about the model; only one has actual stairs, the rest are ramps but in the film all three are seen as stairs. A very minor problem and easily rectified by someone with patience. When finished the model is 9 inches in diameter and a little under 3 inches tall. The base required no work at all and neither did 'Robbie'. I primed the whole lot in matt white and then painted the whole of the C57D with Rover Metallic Blue which comes out as a blue/silver shade. I painted the lower dome, the interior of the stairwells and stairwells in Horizon Steel. Robbie was primed and painted Citadel Boltgun metal overall with Skull white and Ice blue detailing. With the base I just went mad, using various shades of reds, oranges, browns and sands. The logo 'Forbidden Planet' was done in a deep red. Overall a very nice representation of the C57D and at an affordable price. If you love the movie as much as I do, buy this model. This page copyright © 2001 Starship Modeler. Last updated on 8 March 2001.